Pick the best player for each position as well as a sixth man. With that here are your all-time Spurs! 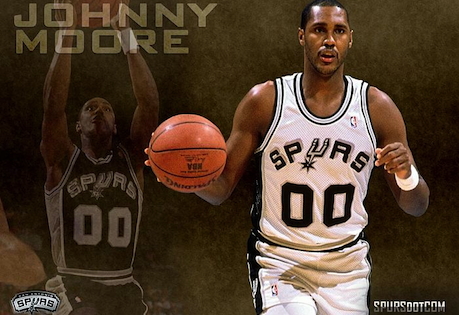 Johnny Moore was putting up over ten assists and almost three steals for the first half of the 80s. Sadly by 1986 he had started fading. Still, he is easily the best point guard the Spurs have seen and an easy pick for my team. Manu averages over 20 points on 58% true shooting to go along with over five assists and five rebounds per thirty six minutes. My only complaint is his playing time, which has been far too low for his production. 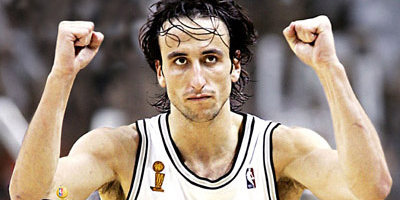 Manu has been under-appreciated his whole career, which is why he was an easy pick ahead of a few other shooting guard greats in the Spurs history. 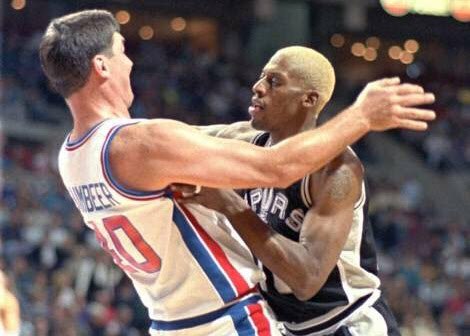 Dennis Rodman only lasted two seasons in San Antonio. That said they were amazing seasons where Rodman focused on what he did best: rebounding. He did this while keeping his fouls and turnovers low and his shooting percentage high. He was also versatile enough to play both the small and power forward so I’ve bumped him down to add him to my team. No surprises here. His three top seasons earned him two MVPs and two titles. 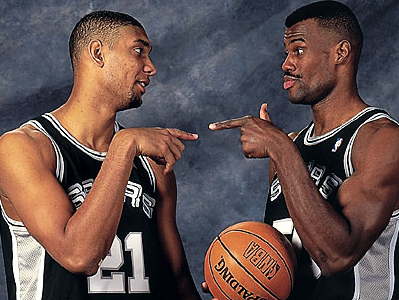 The Spurs have gotten two of the greatest number one picks in the history of the draft. Tim Duncan has kept the Spurs a contender his entire career. We’ll have to see how much longer he can keep it up. 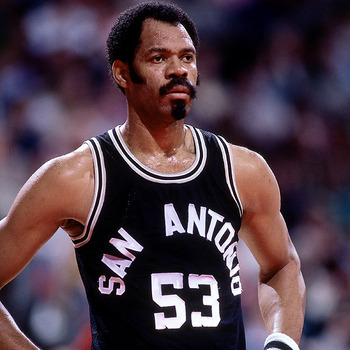 I hope I don’t surprise anyone by saying not only is Robinson the greatest center the Spurs have ever seen, he is also the greatest Spur the Spurs have ever seen. You’ll notice one of Robinson’s accomplishments is that he was great right from his rookie season. What else can I say about a guy that could bring down 30 points, 13 rebounds and over four blocks a night without breaking a sweat? There was no way I could leave the Ice Man off the list. One of our pet peeves around here is players rewarded for high points on poor shooting. 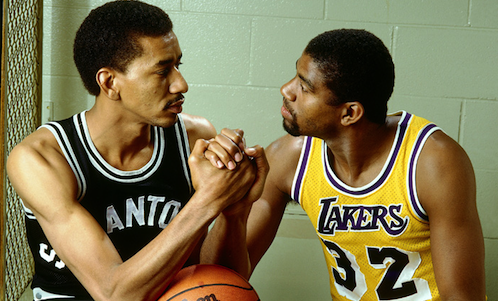 As such George Gervin is definitely a favorite as he was pulling down close to 30 points a night on great shooting. On most teams being a center putting up numbers like Gilmore did and you’re the starter without question. On the Spurs Gilmore is demoted to the bench. I couldn’t decide between Gervin and Gilmore and decided to throw them both on the team. Gilmore is another favorite as he put up numbers like Kareem did in the 80s but didn’t get the recognition. Well here you go Gilmore. These are a lot of fun and I may keep doing them if the lockout persists and there’s fan interest. As we’ve mentioned the lockout has definitely let us talk a lot about tax rules and competitive balance but we do enjoy straight up basketball. If you’ve got any interesting stats stories you’d like us to look into drop us a comment, it’s not like we’ve got basketball to watch instead. Thanks Dre. Out of interest what did Alvin Robertson’s wins produced numbers look like? Holy diminishing returns to rebounding, Batman! Admiral, Duncan and Worm on in your starting 5 (not to mention Manu’s 5 RPG). I highly doubt there has ever been three such incredible rebounders on a real NBA team ever. If there was ever an argument that there would be a significant decrease in each player’s rebounds due to diminishing returns, this is it. Yeah this team is crazy, it’s pretty much overloaded on everything. It’s ridiculous how many top PFs and Cs the Spurs have had. Well, we did see Robinson and Rodman play. No surprise that D-Rob put up his 2 worst rebounding years of his career alongside Rodman (’94 and ’95). In fact, Rodman’s full season leads D-Rob way below his career average. Nearly 15% worse! I’d surmise adding Duncan to the mix would barely add to their rebounding disparity. I’d imagine playing Rodman at SF would hurt his rebounding totals most of all. He’d actually be better in the 6th man role; the team would be far more balanced. You’d always have a front line of 2 of TD/DRob/Rodman and the 3 together would clog the offense (what driving lanes would Manu have!?). But if Gervin is out there, that’s a potent offense. And you’d also keep the 3 bigs fresh all game long (32 min each!). And it works seamlessly since Duncan can play for 4 or 5. Alright yeah so Robinson’s rebounding went down. We don’t dispute this. Defensive rebounds are essentially shared so getting a top rebounder does come at the cost of some of your team mate rebounds on defense (not on offense) Robinson’s defensive rebounds went down a little by a bout 1 a game and his offensive rebounds stayed the same from the year before. However he had his best scoring numbers and the Spurs got the the best rebounder in the game. I can’t buy that Rodman’s insane 15+ rebounds a game weren’t worth the cost of 1 defensive rebound from Robinson who turned into a scoring machine. Rodman is not a 6th man on this team. If we’re worried about people clogging each other I’d put someone else on the bench. That said with Ginobili, Duncan and Robinson for offense I’m not worried about balance as this team is just massively overpowered. It’s an all-time team! It should look that way so IMHO you need to compare it to other all-time teams to make any conclusions how good it would be. Dre – I was just pointing out that putting Rodman in at PF caused Robinson to lose quite a bit of rebounding (don’t look at rebounding totals, look at rebounding percentages). But you wanted to put him at SF. That has issues. Unless you want Duncan or Robinson to come off the bench, instead. Rodman is one of my all time favorite players, but he wouldn’t fit that team at SF. His rebounding wouldn’t add anything more than marginal effects at that point (having Duncan/DRob would have the same effect) and his inability to shoot would clog down the defense. It doesn’t hurt the team when he’s the 4 (especially cuz he can pass), but as the 3 it would hurt. Got to think in terms of synergy as well.